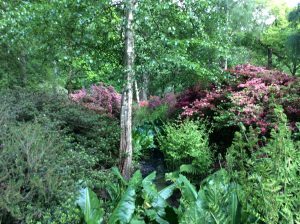 In late spring one corner of the huge Richmond Park harbours an oasis of exotic blooms, which is the Isobella Plantation. 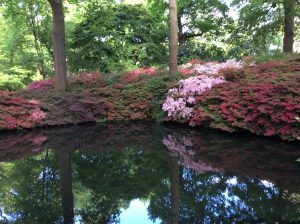 This woodland park was created in the 1830s, when former Prime Minister Lord Sidmouth, then the Deputy Ranger of Richmond Park, wooded off a boggy corner of the park to keep the deer out, and a some native trees and later some rhododendrons were planted. Serious rhododendron planting started after World War II, and now the gardens house the National Collection of Wilson 50 Kurume Azaleas, which were brought from Japan in 1920s by the plant collector Ernest Wilson, as well as rhododendrons, camellias, heathers and all sorts of other trees and flowers. It was opened to the public in 1953. 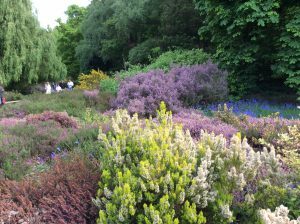 The grounds are managed organically, without the use of pesticides, offering ideal habitat for birds and animals. Beautiful lakes complete the idyllic beauty of this woodland oasis. 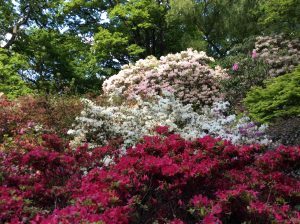 So, we have azaleas and rhododendrons – what’s the difference? All azaleas are rhododendrons, but not all rhododendrons are azaleas. The name Rhododendron comes from Ancient Greek, meaning ‘rose tree’. It is the generic name for over 1,000 types of plants which regard Asia as their home, but are found nowadays all around the world. Characteristically, they grow into big trees with large leaves. Azalea is a type of rhododendron, but it is a small bush with little leaves covered in a dense mass of little flowers. The flowers are also different, in size as well as type – rhododendrons have 10 stamens, and azaleas have 5. 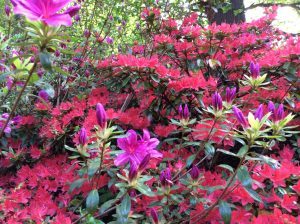 Many azaleas are deciduous, while most rhododendrons are evergreen. What all of them love is a shady boggy ground with ericaceous (acidic) soil, so if your soil is alkaline, forget about growing them, and come to enjoy the Isobella plantation instead! But beware – these beauties are highly toxic, it contains something nasty called andromedotoxins in its leaves and even nectar, to the extent that if bees have too much of it, their honey would have hallucinogenic (as well as laxative) properties…. As we have very few bees here anyway, and as long as we do not go munching on leaves and flowers, Isobella plantation is a fabulous day out in late May – even if it is extra popular and crowded on a lovely day in late spring. Knebworth is known far and wide for huge open air concerts of the rock starts we all know and love. Since 1974 the grounds hosted Paul McCartney, the Rolling Stones, Led Zeppelin, Pink Floyd, Queen, the Beach Boys, Deep Purple, Eric Clapton, Elton John, to name but a few. The history of the house, however, harbours some hidden jams and revelations. Knebworth House came to be in end of the 15th century, when the Lytton family owned a Late Gothic mansion of red brick. During Victorian times it was first reduced to one wing, and then re-built in a Gothic Revival style in middle of the 19th century, during the time of the most famous member of the Lytton family – writer, dramatist and politician Edward Bulwer Lytton (1803 –1873). Remembered now only by the most avid of Victorian historians, Bulwer Lytton was one of the most famous writers of this time. He was born and grew up in London. His father, Mr. Bulwer, was a Norfolk squire, – it was his mother Elizabeth Barbara Lytton who came from the famous Knebworth family. A delicate and intelligent boy, Edward started reading early, and by the age of 10 was writing poetry. His literary career took off during his years at the Cambridge University, making him the most successful and widely read author in the 19th century. Bulwer-Lytton’s novels cover historical fiction, mystery, romance, the occult, with a hint of science fiction. His plays enjoyed popularity in England and America, some being a basis of a couple of operas. Among his friends were leading writers and politicians of the day, such as Dickens and Disraeli. Lytton’s legacy includes over 20 best-selling novels (including The Last Days of Pompeii), 9 plays, 15 volumes of poetry, translations of Horace and Schiller and several volumes of essays. “Pursuit of the almighty dollar” from his novel The Coming Race;. I personally think that sentenced is rather beautiful, and it is not fair that Bulwer-Lytton’s name was given to a contest set up in 1982 by an American University, which gives the ‘best prize’ for the ‘worst writing’…. Edward married witty and beautiful Irish girl Rosina Doyle Wheeler. After a few happy years (and a couple of children) the marriage broke down. Rosina felt neglected due to Edward’s work load as a writer and politician. Edward got custody of the children. Rosina did not go quietly, – becoming a writer herself, she attacked Edward in books and in person, at his plays and at elections. Her memoir was entitled A Blighted Life, – Edward and the family were not pleased and even tried to commit her to a lunatic asylum. It was only in 1970s when her great-great-grandson hung her portrait at Knebworth House that the visitors can see today. Edward Bulwer-Lytton was buried in St.Edmund’s chapel in Westminster Abbey. His son Robert Bulwer Lytton (1831-1891) wanted to become a writer too, but his father insisted that he becomes a diplomat. Robert had to do his writing on the side, while becoming a Viceroy of India and British Ambassador to France. Knebworth House features a separate exhibition of Robert’s time in India. It was during his diplomatic watch there that Disraeli presented Queen Victoria with the grand title of Empress of India. Robert’s son Victor married Pamela Plowden, a beautiful former love interest of Winston Churchill’s. Robert’s daughter Emily married architect Edwin Lutyens (who designed the Cenotaph in Whitehall, and British government buildings in New Delhi in India, as well as numerous country houses in England). He advised his brother-in-law on on extensive alterations to the house to reflect the new Edwardian era in the beginning of 20th century. Lutyens’ associate, Arts and Crafts garden designer Gertrude Jekyll contributed a herb garden design in the shape of an interlaced quincunx – a pattern of five items, four of those arranged in a square and a fifth one in the middle, like in dice or playing cards. The current garden was planted in 1982. A visit to Knebworth House is an enjoyable experience any time of the year, but particularly great when combined with a special event, like Jousting.